Rumor has it that prominent placement in a science-fiction movie can put a kind of "curse" on a brand: witness the fates, for instance, of Atari, Bell, and Pan American World Airways, all of which went south after appearing in Ridley Scott's Blade Runner in 1982. (Even the apparently unstoppable Coca-Cola, its logo flashing so brightly on the future Los Angeles skyline, subsequently put the infamous New Coke to market.) 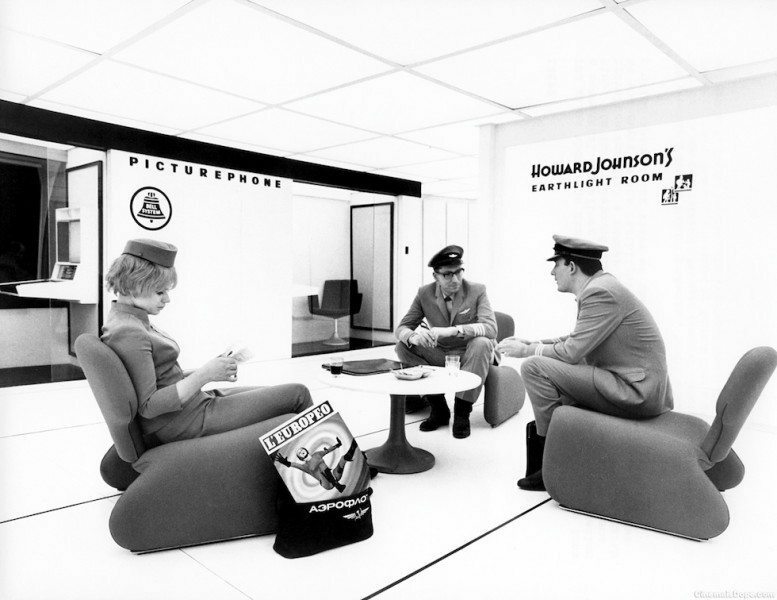 Pan Am, then less than a decade from dissolution, had previously played a high-profile part in 2001: A Space Odyssey. Stanley Kubrick and Arthur C. Clarke's vision of monoliths, Jupiter missions, and too-intelligent artificial intelligence came out in 1968, the tail end of America's midcentury Space Age of the imagination. At that time, Pan Am enjoyed a reputation as the preferred airline of the new "jet-set" — the natural transportation provider, I suppose, for their seemingly inevitable (and inevitably glamorous) holidays in outer space. But who would provide the lodging so far from Earth? Why, Howard Johnson's, of course. 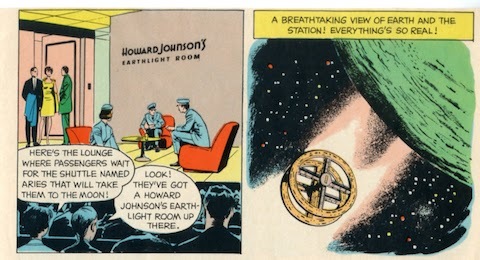 The hotel-restaurant chain, America's largest in the 1960s and 70s, lent its name to the "earthlight room" built into 2001's space station. 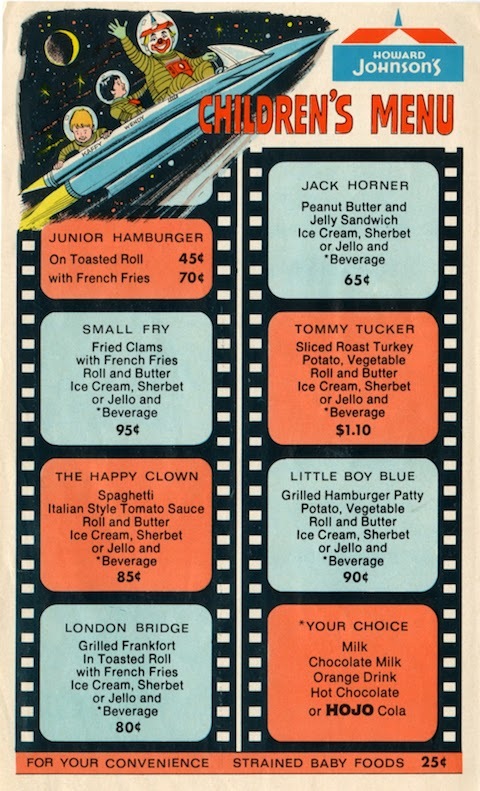 It also offered a special children's menu (produced by the Amuse-a-Menu Company of Boston, Massachusetts) featuring a comic retelling not of the film itself, but of the experience of attending the film's premiere. 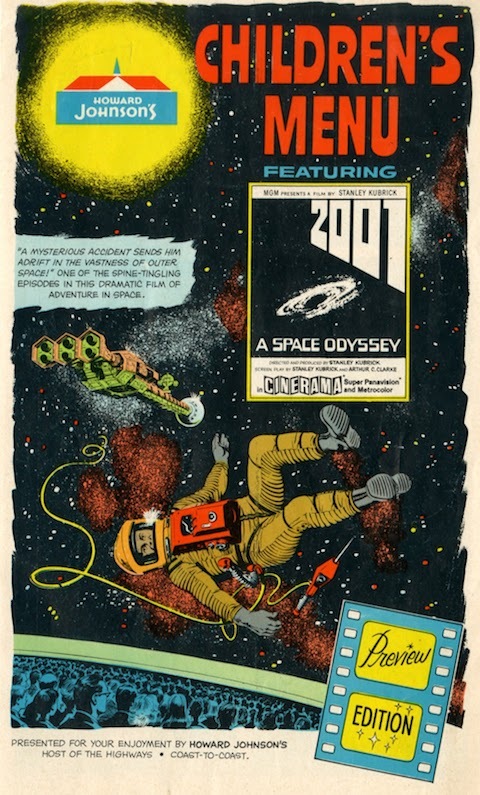 Many of its panels manage impressive recreations of 2001's then-as-now-impressive visuals, though I suspect the writer and artist had to work with few plot details — they make no mention at all, for instance, of the iconically malevolent supercomputer (and arguably 2001's star) HAL 9000. 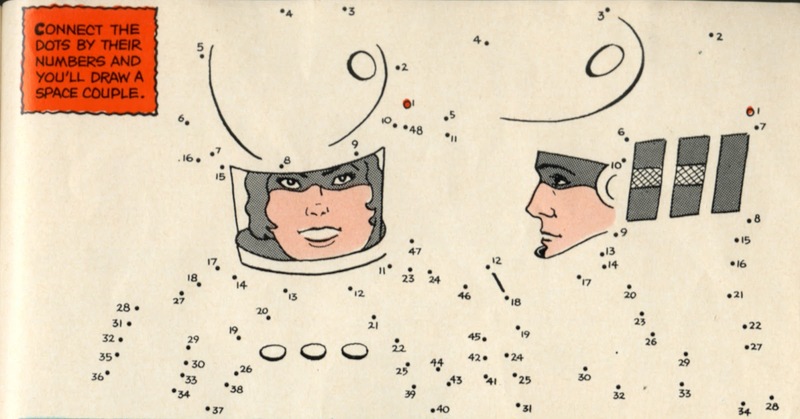 The full menu, which you can browse at Dreams of Space, offers the kids of 1968 an activity page, an opportunity to purchase a 50-cent birthday-themed 45-RPM record, and a host of bland dishes. Born well after 2001's premiere — and indeed after Blade Runner's, though I did hear when Pan Am went under — I nevertheless remember eating all these standards from children's menus everywhere: spaghetti, hot dogs, peanut-butter-and-jelly sandwiches. While I rarely dream of a future where we've developed a spacefaring jet set, I often dream of the even less plausible one where we've come up with appetizing food for the under-ten set.